PIC32MZ clicker is a compact development board with a mikroBUS™ socket for click board connectivity. It carries the PIC32MZ 32-bit microcontroller (1 MB Live-Update Flash and 512 KB SRAM) with FPU from Microchip. To make your prototyping experience as convenient as possible, PIC32MZ clicker is preprogrammed with a USB-HID bootloader. 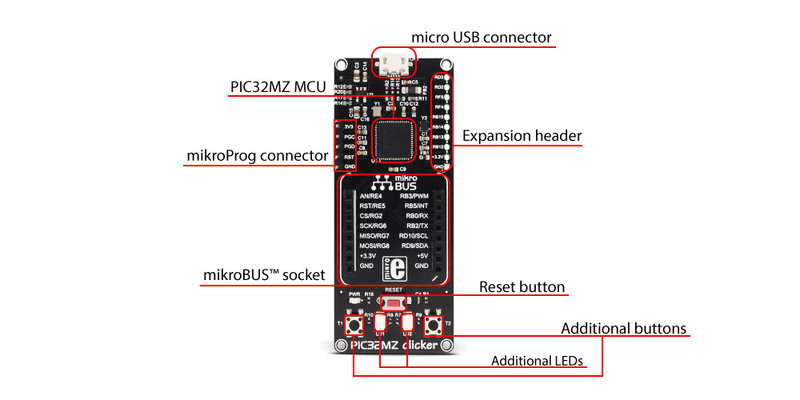 The board features everything you need to get started: a mikroBUS™ socket, a 32-bit PIC32MZ microcontroller, micro USB connector, two LEDs and buttons, reset button and headers for interfacing with external electronics. 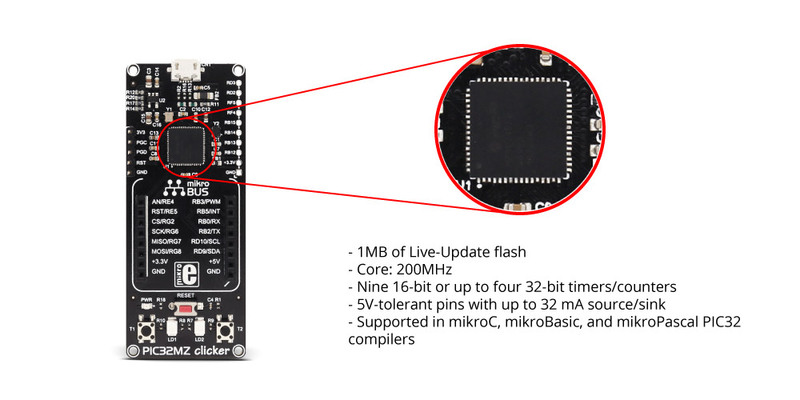 This 32-bit (1 MB Live-Update Flash and 512 KB SRAM) microcontroller with FPU is rich with on-chip peripherals. The PIC32MZ EF family features high core performance up to 200 MHz, an integrated Floating-Point Unit (FPU), a wide selection of peripherals and excellent connectivity options including Controller Area Network (CAN). Take advantage of the constantly expanding range of hundreds of click boards™ - the onboard mikroBUS™ socket allows you to add new functionality to your project. Each click board™ comes with a set of working example code. To make your prototyping experience as convenient as possible, PIC32MZ clicker is preprogrammed with a USB-HID bootloader. Just download our mikroBootloader application and you’re ready to upload your firmware. On-board mikroProg for PIC32MZ connector enables programming through external programmer/debugger.